The question came from a Dad much taller than me. When he asked me, he stood over me just slightly with his palms up as if to say, tell me something good, preschool teacher, because I’m stuck on this one. I told him to count the trees. I will never forget his little chuckle. As if to say, seriously? That’s your answer? Let me rewind a minute though. Because the deeper issue here is that this parent wanted to teach his child something, but he didn’t know how to do it. Quick backstory he was finishing up his PhD and he was used to teaching college kids. That’s very different from teaching preschoolers! Like you just want your child to learn something but you’re not sure how to teach them? Maybe it’s reading, writing, or learning how to do taxes for you (kidding…), but sometimes I think we’re so concerned that our kids will get “left behind” academically, that we overcomplicate things. After my conversation with this Dad, I imagined him walking through a forest of trees and talking about quantum physics. Not exactly the best way to talk to preschoolers about math, but hey? You can’t blame a Dad for wanting to teach his kid something that he’s passionate about. Honestly? I could tell he was feeling a little pressure to make sure that his daughter was “keeping up” academically, even though she was only three. What’s The Real Secret to Teaching Little Kids? But, I’ve got to tell you with preschoolers we need to be less concerned about academics and more concerned with doing the basics like talking, reading, and singing. That’s why I’m thrilled to share this free parent app with you today from First 5 California, a Happily Ever Mom sponsor. First 5 California know how important it is for us to Talk. Read. Sing.® to our kids every day. 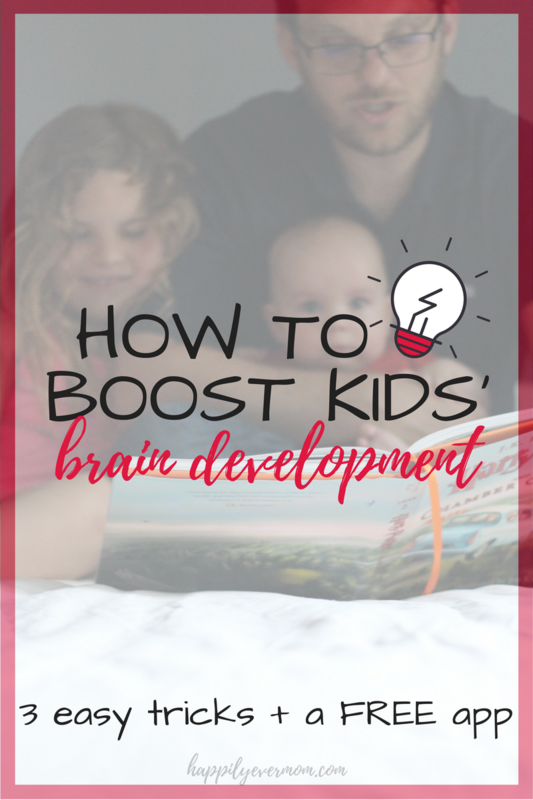 In fact, this is the easiest way for us to boost our child’s brain development. Before I get to the free app, I’ve got to tell you that I’ll never forget when my daughter went to visit our local Kindergarten for assessment. Have you done this yet? They took my daughter back into a room and asked her all sorts of questions. How many letters in the alphabet did she know? Did she know how to write her name? And, how many basic phonetic sounds she could identify? I mean, how was she going to answer? Had we exposed her to enough of these basic concepts? Would they notice a big gap in her development that I didn’t? There’s that pressure again, am I right? Even though child development is my profession, it was a whole different feeling for me when it was my child getting assessed. I suddenly felt a lot of empathy for the Dad who asked me the math question. At the end of the day, I think we are all trying to do our best, but sometimes it’s unclear what doing “our best” is for our kids. So, let me be honest. Doing our best doesn’t have to be overwhelming. Which is why I first wrote a post about First 5 California’s awesome website and all of the materials that they give out to parents for free. They really are designed to be a resource for families everywhere and they prove it by offering bilingual resources as well. In our first post with First 5 California, we tracked how many times we were reading, singing, and talking together by printing out one of their printables and putting it into a frame so that the printable became reusable. You can see that HERE. But, how do we Talk. Read. Sing.® to our kids every day? 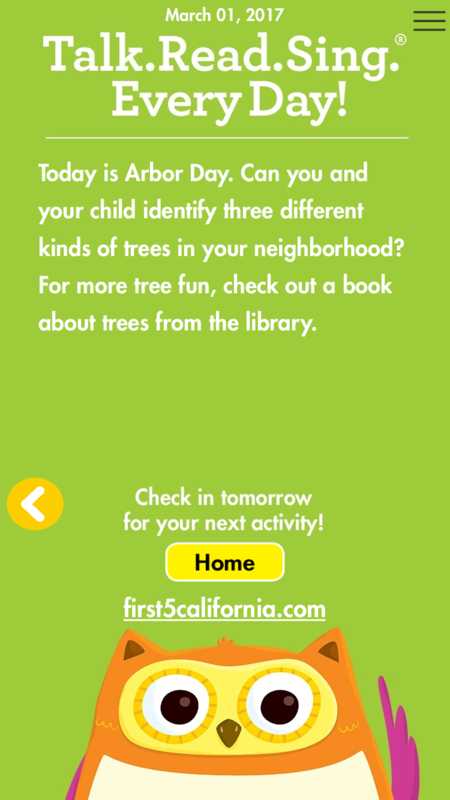 In order to get inspired about what activities to do with your child, First 5 California has created an app for parents that will deliver little activities to do with your kids right to your phone – you can check it out here. I wish I could have given this to my parent all those years ago! Look at the sample activity below (hint: it has to do with trees. ;)). Delivery System: With the app, you can enter the custom time that you want the app to deliver activities to your phone. Maybe it’s the first thing in the morning so that you can discuss the activity over breakfast or after school so you can talk about it on the drive home. You decide what time is best for your family. 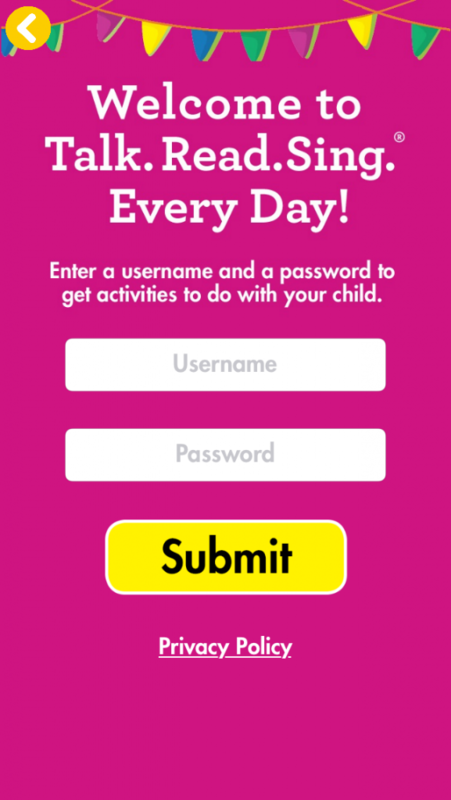 Website Printables: Need a quick activity for your kids? Download activities from the website that go along with the app. My daughter loved the printable about drawing your favorite animal. Download on any device: Since the app is free, you can have anyone download the app for a Grandparent, babysitter, or friend so that you all can do the activities. These activities are great inspiration for how to interact with little ones! #3 is the real reason that I love this app: It’s accessible to anyone and everyone! Regardless of your income level, if you’re a busy work at home mom, stay at home mom, or full time working parent, all of us have access to this simple app that helps boost brain development. I love that all we need to do to help boost brain development is to keep it simple. Download the app. It is available on the App Store and on Google Play. And, always remember to count the trees. Thanks again to First 5 California for creating an app that makes it easier on us to Talk. Read. Sing.® every day!